In no particular order, below are our most popular flower varieties. 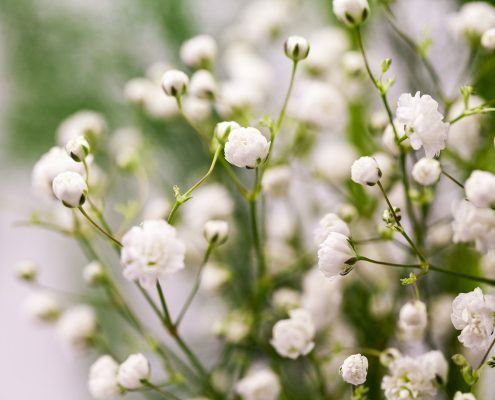 Much loved by florists and flower arrangers, Gypsophila, or Baby’s Breath, is well known for its delicate sprays of tiny, white flowers. The name derives from the sweet scent or the flowers. 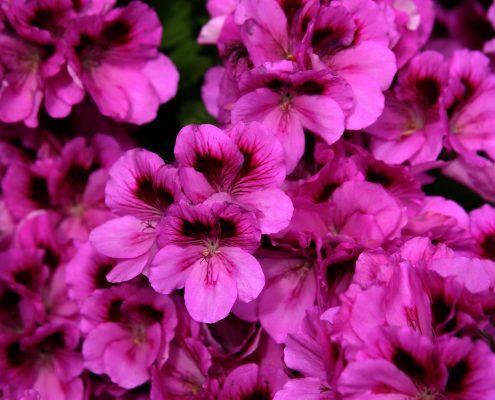 Schizanthus Angel Wings is a beautiful annual that is better known as Butterfly Flower. It easily grows from flower seeds and attracts butterflies to the garden. 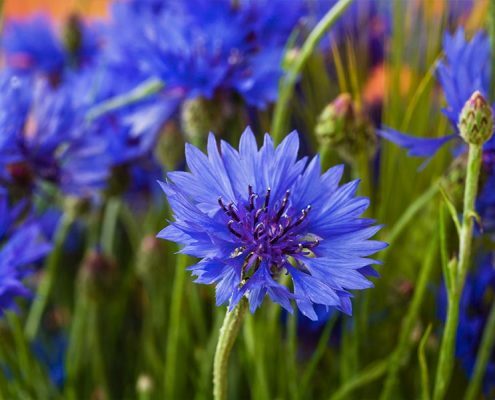 An iconic image of rural meadows, the bright blue cornflower was once a common sight in cornfields, but it has declined dramatically in the wild in the last 60 years. The French wear cornflowers much like we wear poppies: as a symbol of remembrance. It is known as the Bleuet de France. 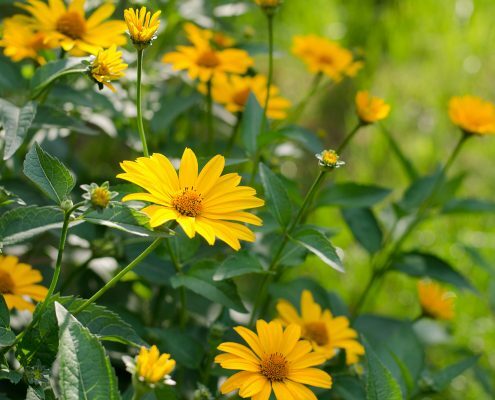 Heliopsis or False Sunflowers, are easily confused with perennial sunflowers, but they have the advantage of being more compact (less floppy) and bloom earlier so you can have more sunflower-like flowers longer. During winter, Myosotis, look unpromising, with undistinguished leafy rosettes. But as spring advances, they turn into a carpet of rich blue. 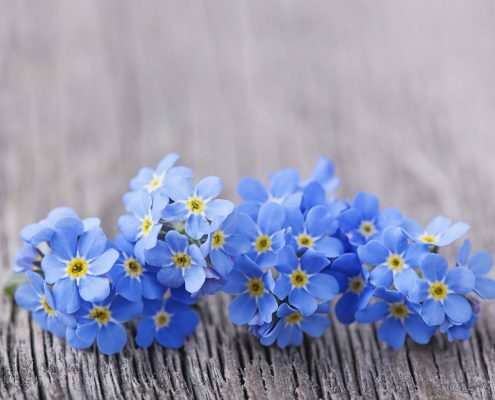 The name (apparently) derives from a lover who, while gathering the flower, fell into a river and cried ‘forget-me-not’ as he drowned. 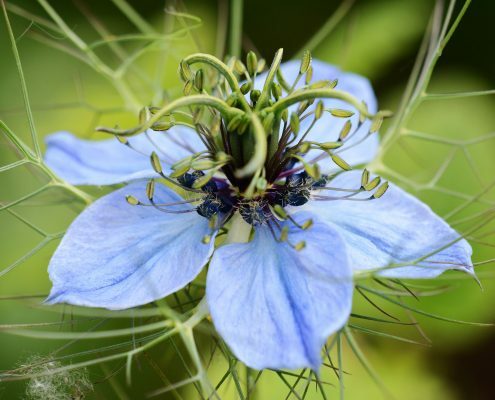 Love-in-a-mist is a charming old-fashioned annual in the buttercup family that blooms in spring and early summer. The genus name Nigella comes from the Latin word for black and refers to the plant’s intense black seeds. The aromatic seeds have been used for culinary and medicinal purposes. In bloom around the solstice, this large daisy is a sure sign that summer has arrived. It is loved by pollinating insects’ especially butterflies and bees. 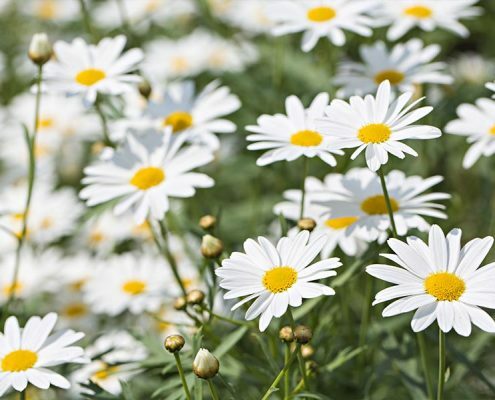 Before the 16th century it was more commonly known as the ‘Moon Daisy’ or ‘Dog Daisy’. With its brilliant scarlet flowers, usually with a black blob at the base of the petals, this native wild flower needs no introduction. 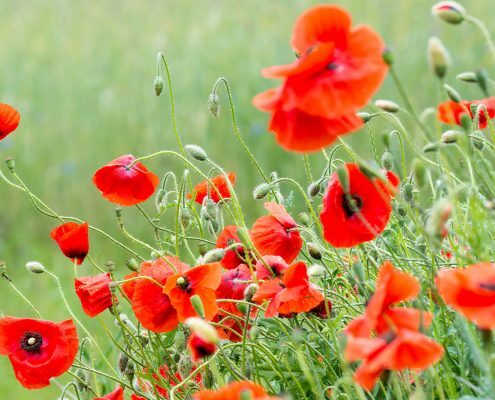 In more recent times, it has become the symbol of Remembrance. 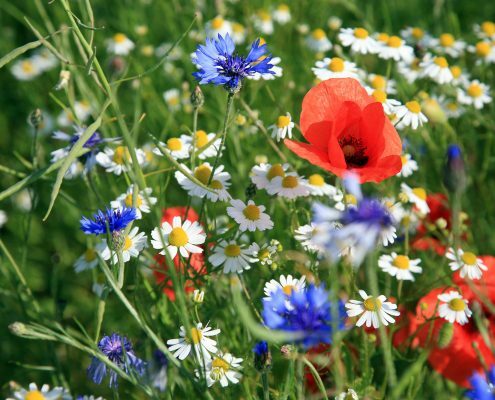 This includes Poppy, Ox-eye Daisy, Corn Chamomile, Corn Marigold seeds. Whilst we are happy to offer a mixed wildflower (it is one of the most popular) these seeds will germinate at different rates.